Daily menus, open kitchens, and women chefs may seem commonplace in today’s restaurants, but 40 years ago they were downright radical. Coming out of the social upheavals of the 1960s, California chefs, farmers, and food artisans of the 1970s bucked tradition in the kitchen and the fields, stirring a culinary revolution that has reverberated around the world. 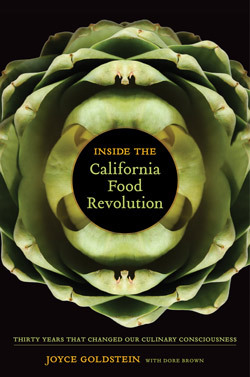 Joyce Goldstein, one such pioneer, assembles this complex history in her new book, Inside the California Food Revolution: Thirty Years That Changed Our Culinary Consciousness (University of California Press), weaving together nearly 200 interviews with farm-to-table visionaries such as CUESA founder Sibella Kraus, Warren Weber of Star Route Farms, Steve Sullivan of Acme Bread, and Sue Conley and Peggy Smith of Cowgirl Creamery. Like many chefs of her generation, Joyce was largely self-taught, nurtured on the writings of Elizabeth David, Craig Claiborne, and Irma Rombauer. After years of teaching cooking classes, she earned her restaurant chops at Chez Panisse, and in 1984 she opened her own restaurant, Square One, where the Mediterranean menu reflected California growing seasons. Nearly 30 years and 26 cookbooks later, Joyce remains a familiar face at the farmers market and a fierce advocate for seasonal cooking. We talked with Joyce about California’s food legacy and future. CUESA: In the book, you say that California cuisine is “American cuisine, only more so.” Can you explain? Joyce Goldstein: I was playing on the opening quote by Wallace Stegner (“Like the rest of America, California is unformed, innovative, ahistorical, hedonistic, acquisitive, and energetic—only more so”). In California, everything is a little more intense. We tend to plunge first, which is why we have so many entrepreneurs. In the 1970s, California was a totally permissive environment, which the rest of the United States was not. CUESA: How do you characterize the style of cooking that developed in California in the 1970s? JG: You can’t sum it up neatly. It encompasses many things, like fresh, seasonal, and local. For many years, menus never changed. There were tomatoes, mozzarella, and basil on every menu, even in the winter. If a chef had a recipe with asparagus, they flew those asparagus in no matter what season it was. In California, we decided we would serve things that were in season and local. Restaurants like the French Laundry and Chez Panisse were the first in the country to change the menu every day. We also had self-taught chefs. Everywhere else, people were going to cooking school or working their way up through the ranks. We had a lot of people opening restaurants who had never worked in a restaurant or gone to cooking school. And it was not only chefs who were self-taught. Warren Weber taught himself how to farm organically. Bill Niman learned how to raise animals himself. Laura Chenel taught herself how to make cheese. Steve Sullivan taught himself how to bake bread. We had no rules, and we had an audience to support us. It was an amazing climate. We also had the largest number of women chefs anywhere in the world. CUESA: What else allowed this approach to food to develop and flourish in California? JG: Many in our generation went to Europe or Asia after we went to school. In those days, you could travel and eat out inexpensively for months and months. People came back and said, “Why can’t we have radicchio and arugula here?” That pushed us to ask farmers to grow these things here. In California, we have a big advantage because our seasons are longer, and you can grow just about anything. We had farmers who were willing to take a chance and grow new things, and people like Georgeanne Brennan (of Le Marché Seeds) who brought in seeds from Europe. Before 1970, you could only buy big heads of iceberg lettuce, all the herbs were dried, and you could not buy a wild mushroom if your life depended on it. There was nothing custom or specialty, and nothing was organic. You could not get many of the foods that we now take for granted at the farmers market and supermarket, like Chioggia beets, haricots verts, and multicolored cherry tomatoes. These were huge changes, and they started here. CUESA: As terms like farm-to-table, sustainable, and seasonal make their way into the mainstream, what do you see as the next frontier? JG: I think you will see a lot more interest in local food, since so many more restaurants are hooking up with specific farms, as well as personal food that doesn’t necessarily follow traditional recipes from a culture, but uses good ingredients and flavors in a personal manner. I recently read an interesting article in the New York Times about Mark Peel and what happens to older chefs. Where do they go with their knowledge? It’s a young person’s profession. If you’re a serious chef, your life is not glamorous. You work seven days a week, you’re sleep deprived, and you injure your body. It’s nothing like television. The older you are the more knowledge you have, but the younger you are the more energy you have. It would be great if there were a partnership in restaurants in which the older people shared knowledge, and the younger people shared their bodies. It would be nice if there were a greater appreciation of the people who have been here for a while, keeping them in the pipeline in some valuable way. CUESA: How can chefs effect broader change in our food system? JG: It’s an education thing. It’s reaching kids when they’re young, and it’s getting more people to know how to cook when they are in grade school and high school. It pays to teach simple techniques, so people actually go home and do them. With these techniques and good ingredients, people can make very good food and save money. We can do it, but it’s going to be a long process. We’ve only just begun. Join us for a free cooking demo and book signing with Joyce Goldstein in the CUESA Classroom tomorrow at 11 am.